When September is whisked away by the Green Wind and the Leopard of Little Breezes, she expects to find the Fairyland of her dreams, a world filled with fairies and adventures. The reality of the realm is different from anything she could have expected. The ruler of Fairyland is a young girl who has revealed herself as a tyrant not long after taking the crown. Every creature in Fairyland fears her and does her bidding, although bitterly. September takes it upon herself to free them from the Marquess's grasp, but it is harder than they say in the stories. And it is not only that that the stories have wrong. The creatures are all different from tales, and the rules are so many it is impossible for anyone to wrap their heads around it. Not that it matters. All September wanted was an adventure, and one she shall have. 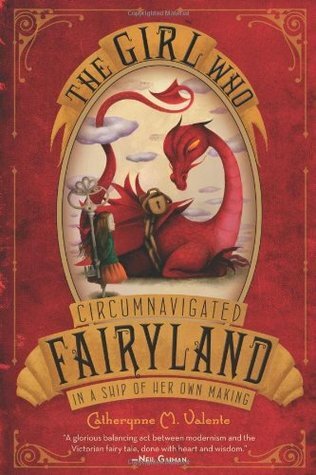 The Girl Who Circumnavigated Fairyland in a Ship of Her Own Making feels like an homage to Alice in Wonderland, to fairy tales and folklore all at once. Not only in its theme but in its whimsical tone and writing. Just like in these "stories for children", there is more to the book than is at first apparent. The novel is riddled with critiques to society - Fairyland itself is early on spoken of as a mirror of our own world -, with challenges and prods at the "grown-ups". There is violence, slavery, despotism, bureaucracy, treachery, and beauty. An insurmountable amount of beauty. It is, in a way, an impossible book to review, but I shall do my best. It should first be said that the imagination in this book is out of this world. The worldbuilding is solid and vast. There are rules to Fairyland that in their nonsense make the most perfect sense. For why should not a library and a wyvern breed wyverarys? Why should not witches need a spoon and special clothes to see what they wish in their cauldrons? And why, pray tell, would a marid not meet their children before having even found their partner? Well, perhaps it sounds a bit odd, but read the book and you will soon see it is not. Most of all, that is due to one very simple thing: the language. Valente is an artifice. The writing is humorous, magical, and, most of all, unique. It has been a while since I found a book with such a strong, marvellous voice that will convince you of anything and everything. It puts many writers to shame. There are hundreds of passages I could quote as proof, but picking them would be a herculean task as it would be too easy to dump the entire book here, and we wouldn't want that. As for the characters, there is no lack of diversity, both in species and in nature. There is someone for every taste. From the adventurous human September and the learned wyverary A-Through-L, to the quiet marid Saturday and the quasi-omnipotent human Marquess. The supporting cast too is as different as the shapes and colours of the autumnal leaves. The characters are not at all flat despite the seeming archetype some befit upon their first appearance. There is as much more to the eye in Fairyland as there is in the characters. But most of all, the story itself are fresh. Despite the many parallels with Alice in Wonderland, Pratchett, Gaiman, and many others, the book stands on its own. It recognizes its ancestors but creates something completely new. This is not a rip-off or an attempt at imitation. The Girl Who Circumnavigated Fairyland in a Ship of Her Own Making is a masterpiece of its own. If you want to read something new and different, complex and simple, do not hesitate to pick this book. It will blow your mind.